The biggest change will be to the way local government is organised in Wycombe. No mater what happens the current two tier structure will be dismantled and new organisations will be created to look after our town. Once the local government structure is announced yours truly fears our town may lose its identity. Perhaps our town needs its own logo so people can identify instantly with Wycombe when they see the logo? 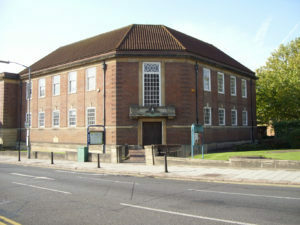 There is a good chance that a ‘town council’ may pop up in Wycombe. Every organisation needs a logo so perhaps if my logo for Wycombe is good enough they could adopt it too and save £££’s on consultancy fees for a branding/marketing agency to create a bespoke logo on their behalf? Over the past few days my good self has been racking my brains, purely for the purposes of entertainment of course, to come up with a new ‘logo for Wycombe’. So what should the logo look like? Well there needs to be something in the centre that people can identify with instantly. Then perhaps there should be other symbols around the edge and finally underneath an motto, in Latin of course, to give a brief message outlining the present state of the town. Sadly my good self is terrible at drawing on an electric computer so yours truly will describe what my plan for Wycombe’s new logo should look like and you can form a picture in your imagination. Now, what could be suitable for the central image? Something that sums up our town…. What could it be? 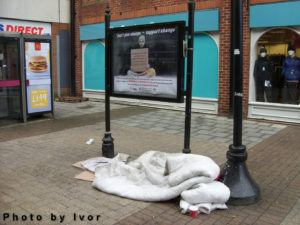 How about a tramp sitting on a dirty duvet begging in White Hart Street? Yes, that’s something that everyone can identify with Wycombe. Around the edges of the logo perhaps there should be four images to show what the town has to offer? 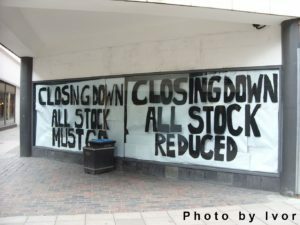 Perhaps a picture of an empty shop or one holding a closing down sale would be suitable for the first of the four images? After all there’s lots of empty shops in Wycombe. Everyone knows the marvellous former library building in Queen Victoria Road, which sadly has been left to rot for over TEN years since it closed at 4.00pm on Saturday 19th April 2008. Yes, the former library building should definitely be on the edge of the logo. A picture of a fast food outlet would also be suitable after all once nice areas like Frogmoor and Desborough Road are now full of fast food shops. What could the last of the four images be? Ummmm….. I know! A drawing of a Public Space Protection Order (PSPO) notice on a lamppost outlawing prostitution in the Desborough Road area. A Public Space Protection Order warning notice in Desborough Road, High Wycombe. There, five images that sum up modern day Wycombe. Anyone seeing those images will know instantly what our town is like just by looking at them. All my logo needs now is a few finishing touches. 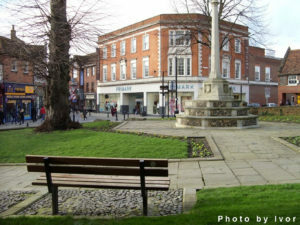 How about a few words in Latin to sum up the town? After many attempts with the translation powers of Mr Google yours truly has decided that perhaps ‘Optimus dies abierunt‘ is suitable? Translated Mr Google assures me it means ‘Best days gone‘ which surely just about sums up the town?